Nestled in the foothills of the Palo Pinto mountains approximately 90 miles west of Fort Worth, you’ll find the quaint little town of Possum Kingdom. With more than 18,000 acres of clear blue water, beautiful cliffs and rolling hillsides, Possum Kingdom is Texas’ best kept secret. 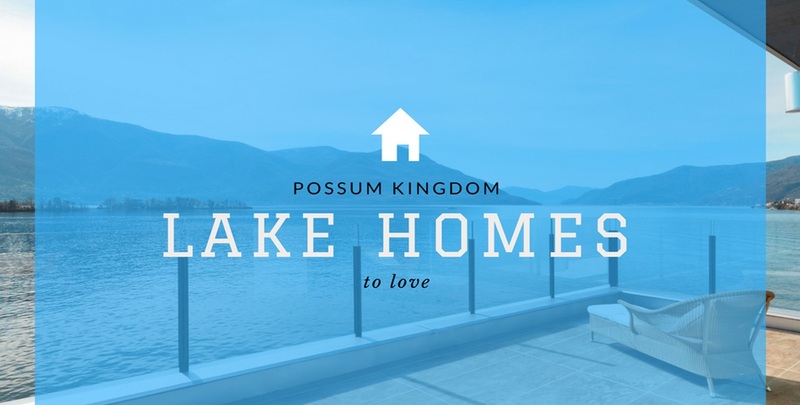 Whether you are looking for vacation home or a forever home, Possum Kingdom Lake has the amenities and services to meet your every need. Breathtaking views on a two-acre lot: This beautiful home is energy-efficient, and the open concept design is perfect for entertaining family and friends. Each room in the house has either a balcony or a porch so everyone can enjoy views of the lake and land. Located in the gated community of The Hills Above Possum Kingdom Lake, residents are able to enjoy upscale amenities which include pool, private boat dock, and community cabin. Stunning, Panoramic View: Feel as if you are on top of the world while viewing this STUNNING, PANORAMIC VIEW and its surrounding valley! Amazing sights of nature and beauty await you in this pristine austin stone house sitting on an expansive 1.2 acres on the NE side of PK lake. Walls of large windows dominate the back side capturing the magnificent sunsets found here. Exquisite attention was paid to every detail including the 3 separate AC & heating zones and other energy efficiency additions. Back patio is one-of-a kind: 2350 sq ft of Oklahoma Blue Flagstone is absolutely perfect for entertaining! Rustic Charm Upscale Living: This peaceful home sits on two acres with over 100 established oak and elm trees and invites you into a state of tranquility the minute you drive up. Upon opening the front door you will find knotty alderwood cabinets & trim throughout, hand scraped wooden floors, and cedar box beams in living room which opens beautifully into the luxurious outdoor living area. Sitting here you will enjoy not only the sights and sounds of nature all around but also the impeccable native, drought tolerant landscaping that surrounds this unique home. Chalet Style Elegant Home: You won't find many of these one-of-a kind homes here! Huge White Douglas Fir logs from British Columbia were shipped in to build this beauty. Unbeatable combination of upscale finish out and mountain-top feel to this 5 BDR approx 3285 square foot home sitting on two impeccably manicured acres. Gorgeous hickory cabinets, red oak, hand-scraped hardwood floors in the great room and slate in between the red oak in the kitchen. Unmatched tranquility and spectacular views of the lake from the back of the home. Majestic Stone Villa: You will feel like you are sitting inside an Italian villa hidden away in a little known cove. This PRIVATE lake home, a one-of-a kind gem, is just 40 STEPS from back patio to your personal boat dock with 2 slips, and sundeck to boot! Perfect for tranquil afternoons of fishing or swimming! This 4 BDR 3.5 BATH rock house with huge window views, rests in a quiet cul-de-sac behind a 24 hour guarded gate security entrance. With two spacious balconies and a unique winding staircase to separate the two, this home is perfect for entertaining or family gatherings! Best of Possum Kingdom Lake: The best of PK Lake can be found here at this 2 Bdr 2 Bath Condo at Sportsmans World. Here you will find an intoxicating combination of beauty, tranquility, boating, relaxing, and celebrating! Just a few fun events at SMW that are sure to create lasting memories include the annual Red Bull Cliff diving and 4th of July fireworks show. All of this at your hassle- free villa. Just lock up and leave until your next visit. This is one of the larger condos in Paradise Villas with its upstairs loft area that can be used for extra sleeping, game room, or office. The composition deck is the perfect place to enjoy outdoor dining or unbeatable sunsets! Many development amenities to boot including use of the Marina!